Maybe you don't need another World War II shooter, but how about three? If recently spotted listings on GameStop and Amazon are accurate, a new Call of Duty compilation, dubbed Call of Duty: The War Collection, will be released next month. The collection bundles together the three WWII-based games in the series available on Xbox 360: Call of Duty 2, Call of Duty 3 and Call of Duty: World at War -- all for $60. Given that Call of Duty 2 was never released on PS3, it seems unlikely that Sony's platform will receive this particular collection. 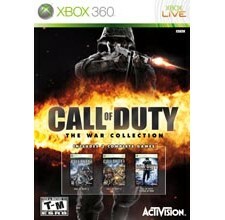 That's three (old) Call of Duty games for the price of one standard Xbox 360 game. Not a bad deal, especially for Modern Warfare players in need of a history lesson. According to GameStop and Amazon, The War Collection will be released this June. I never played any of these. I recently aquired COD: Classic on XBLA. This will be a nice addition. Good collection of games & well worth playing, for me COD2 is still the best single player game in the entire series and COD3 has the best multiplayer, I enjoyed World at War too though most people hate it, but then the majority of the haters are IW fanboys, they always hate superior games. COD 2 is godly, as s COD 3 online. Me in a Tank > j00. I liked WaW Mp-blast back to the best ever-CoD3! Stillgo back every now and then. Then again,with the release of this pack,we might get a resurgance in CoD 3 players online! Oh yes!! !